This south facing villa is located in Bonanova, very close to Palma, ideal for families and offers a great view of the sea. The property has a constructed area of approx. 680m2 sitting on a plot of approx. 1015m2. On the entrance level you will find a large living room with a fireplace, a smaller living area with access to a terrace, a dining room, a fully equipped kitchen with access to a staff room with a private entrance, an elegant master suite with private bathroom and two further bedrooms and a separate bathroom. The lower floor disposes of a living room with a fireplace, two bedrooms with access to the same en-suite bathroom, a wine cellar, a storage room and a guest toilet. In addition, there is a guest apartment with a bedroom, an en-suite bathroom and a walk-in wardrobe. 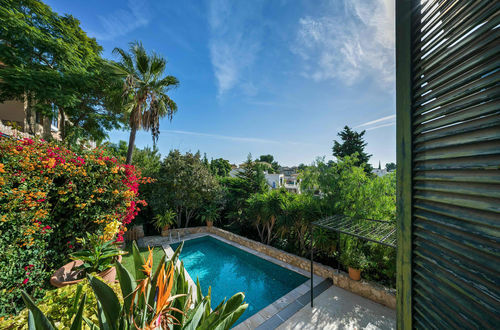 The fantastic outdoor area has several open and covered terraces with seating, BBQ area and a fireplace, a charming Mediterranean garden and a large swimming pool with a pool house. Other features of this exceptional property include a garage with an electric gate, several other spaces for vehicles, reversible air condition and a patio. Bonanova is a quiet residential area very close to Palma`s center. Restaurants, bars, cafes and shops can be found in the immediate vicinity. The beautiful sandy beaches on the South-West coast are a short drive away.